Our impending departure from the EU has generated a lot of fresh ideas about what UK food, farming and environmental policy might look like post Brexit. The Government in its Health and Harmony consultation and more recently the Agriculture Bill has emphasised greener approach focusing public money on public benefits. What does this mean in practice and how can the organic movement respond? Sue Hayman, Shadow Secretary of State for Food, Environment and Rural Affairs, gave the opening address and said the development of the new Agriculture Bill brings great opportunity for organic. “The Agriculture Bill provides a huge opportunity to integrate environmental and food benefits. We know they’re compatible, and we must make sure policy supports this,” said Ms Hayman. She said there are clear benefits to organic methods of farming and questioned why, when organic delivers in so many areas of national policy including food and public health, environmental protection and climate change mitigation, government has failed to recognise the merits of organic, unlike other countries. “The development of a post-Brexit UK agricultural policy is a seminal moment and talking proactively is very important. 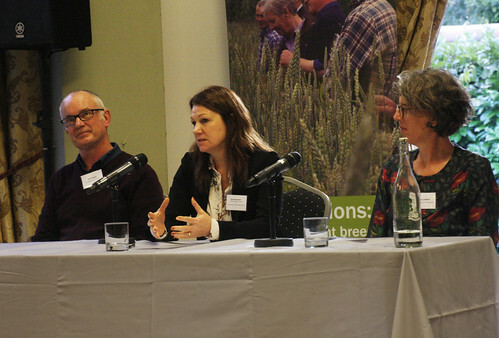 Sustainability must be at the forefront of a thriving British farming, food and drink sector,” said Ms Hayman.